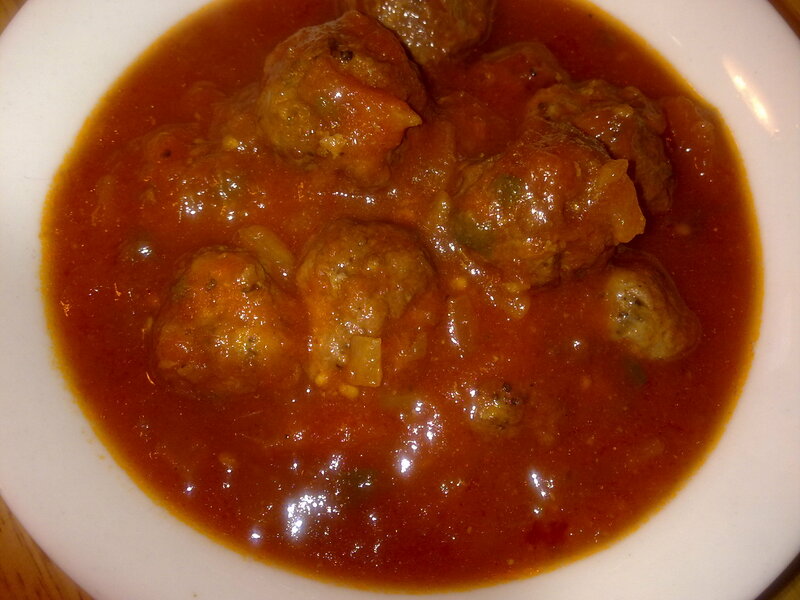 This was my first attempt at meatballs in red sauce after a recommendation from my best friend Iqbal. It turned out pretty good. My husband loved it, and he hates ground beef. So, now I know how to make him eat it. 6)1/2 small can of tomato paste–more if you like. Combine the ground meat, with 3 gloves of minced garlic, 1tblsp of oregano, salt, pepper, and 1 tblsp of olive oil. Roll into balls–about the size of a quarter–and lap on a baking sheet and bake at a preheated 350 degree oven for about 15 minutes. Don’t bake them more than 15 minutes of else they will get hard. Note: you can fry them as well if you like, but I prefer baked to fried. In the meantime, while the meatballs are baking, make the sauce. In a pot, under medium heat, add the rest of the olive oil and brown the onions. Add the garlic and sautee a little. Then add the peeled and diced tomatoes and salt and let cook until the tomatoes are softened. Then add the tomato paste, pepper and add 2-3 glasses of water, depending on how thick you want the sauce to be. Let simmer, and once it starts bubbling add the meat balls and let simmer until the oil rises to the surface. Turn off and garnish with the cilantro. Serve either on a bed of white rice, angel hair pasta, or bread. Try this with butterfly pasta (farfalle) ! Will do :) Thank you for the suggestion.